A family's Christmas was set to be ruined when their beloved dog went missing on Christmas Day. Dressed as a Christmas pudding, Winston the dog went missing after being spooked by fireworks in the local area of Henlade, Somerset. 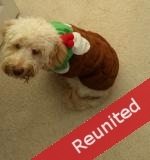 Winston was listed on PetsLocated as lost at 11.30pm on Christmas day by his owners, the finder added him as found at 12.10am Boxing day morning – a record 40 minutes later he was successfully reunited with his owners. Victoria Sadler, Winston's owner felt all her Christmases had come at once when he was found, she said: "I'm just so happy to have been reunited with Winston and it's all thanks to Pets Located. It the best Christmas present ever." Founder of PetsLocated Catherine Inglis is delighted with the reunite, she said: "Losing a pet at any time of the year is traumatic, but at Christmas it makes it that bit harder. With most welfare centres closed on Christmas Day, our service continues matching 24/7, even on Christmas Day! We were delighted that we could help reunite Winston with his owners as speedily as we did and bring a little festive cheer to him and his family." www.petslocated.com is a national online resource designed to reunite missing pets with their owners. Animal centres, rescue services, vets and the general public, once registered can list any lost and found pets - including full descriptions and photos. The website's automatic search technology works around the clock searching and matching, and e-mails owners as soon as a potential match is made.